CAHA is committed to building a healthy culture throughout the Tri-County by developing and expanding initiatives to promote healthy behaviors and well-being. 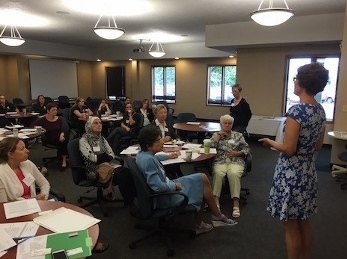 The Healthy Lifestyles Committee recently went through a Health Equity & Social Justice Exploration Series, comprised of tools, assessments, resources, guest speakers and in-depth analysis of the root causes of inequity. The series goal was to raise awareness of health inequity; identify actions that CAHA members can take toward implementing health equity practices and policies in their organizations; and develop a greater comfort level and common language when speaking about health inequities. The series was concluded with participants creating a personal and organizational Health Equity Action Plan. Jessica Yorko, Health Equity & Social Justice Coordinator for the Ingham County Health Department played a major role in developing and facilitating this series. The topics discussed, and knowledge gained through this series has been instrumental in informing one of CAHA’s overarching focuses for 2019/20 of addressing racial and ethnic health inequities. CAHA is building its capacity to facilitate difficult yet needed conversations, and is continuing to partner with Ingham County Health Department and the Truth, Racial Healing & Transformation process, https://healourcommunities.org in this endeavor. Choosing Health!® is an initiative designed to provide opportunities for the Capital Area to learn about and use existing programs to achieve healthy lifestyles. Choosing Health!® focuses on increasing physical activity, encouraging healthy eating, preventing substance misuse, and promoting mental health. What does Choosing Health!® look like? Increasing walking, eating fruits and vegetables, drinking more water, sleeping enough, quitting tobacco use and managing stress. The Capital Area Parks and Trails brochure highlights 36 destination parks and trails throughout the tri-county that can be used for physical activity. Over 75,000 brochures have been distributed to more than 250 community organizations. Let’s Walk for Medical Practices utilizes the Parks and Trails Brochure as a tool for physicians to talk with their patients about the benefits of walking. Over 65 medical practices and 150 physicians became engaged in this program, with a patient reach of over 187,987. Let’s Walk and Talk with a Doctor (LWTD) embraces relationships with the medical practices while highlighting different parks and trails in the Tri-County. LWTD is an opportunity for the community to learn about the benefits of walking from a physician then enjoy a one-mile walk with the physician. In 2015, there were 11 physicians involved with 10 different walks, with a cumulative attendance of 314. Survey results showed an increase in how often parks and trails are utilized for physical activity. Destination Walking Signs point to a nearby park, trail, or community location that is within a 15-minute walk, with the intent of raising awareness of the many great destinations that are within a short walking distance and helping people incorporate walking into their daily routine. Seventy-eight signs were placed throughout nine communities in the tri-county. Tying into the Surgeon General’s Call to Action to Step It Up! and be more physically active through walking, the HLC made a decision in the fall to increase the number of walking groups in the Tri-County and began the task of creating a Walking Group Toolkit. The Toolkit is a step-by-step instruction guide on how to form a successful, evidence-based walking group. A major component of the Toolkit is tapping into the social support provided through a walking group, which can substantially help sustain walking efforts. Choosing Health® Rallies help connect Tri-County residents to healthy living resources in their communities, from camps and gardening classes to martial arts and health insurance. Over 1,000 individuals throughout the tri-county attended the 2015 community-wide health rallies to learn about free and low cost healthcare and healthy living resources. Fifty-three percent (53%) of rally survey respondents indicated they became involved with at least one of the healthy lifestyles resources that were featured at the rally. For the second year, the Winter Rally was combined with the Winter Warm Up Kickoff, in partnership with Community Partners in Health. The Rally promoted health-related community resources and programs available in the winter. Forty-four (44) local organizations showcased what they had to offer. Activities included children’s games, health assessments, healthy cooking demonstrations, a walk through the mall and Taste of Health (healthy food samples from area restaurants). Attendance was over 465. 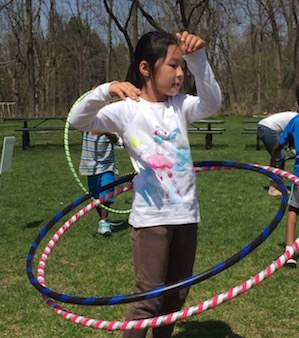 The Spring Rally was held in partnership with the Fenner Nature Center and had the biggest attendance to date, with over 530 adults and children learning about existing community resources and programs related to healthy living. 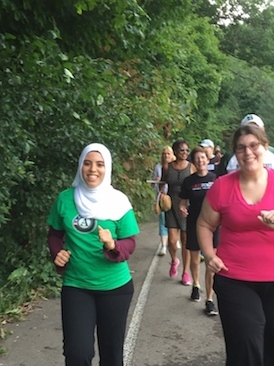 The Rally featured 38 area organizations and restaurants, physical activity, healthy eating demos, health assessments, and a walk along Fenner’s trails led by a local physician. 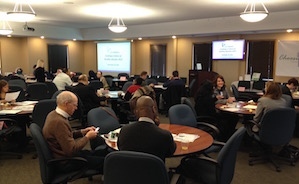 CAHA has held five Community Leaders Breakfasts to bring together community leaders from around the Capital Region to share information and strategize on how to collaborate and continue growing the Choosing Health!® healthy living campaign. Each year, about 100 health care, education, advocacy, civic and business professionals from Ingham, Eaton and Clinton counties learned about the successful launch of cutting-edge healthy living programs throughout the Tri-County and discussed how we can make even greater healthy lifestyles strides in years to come. In addition, representatives of area organizations presented briefly on their organization’s healthy lifestyle programs.